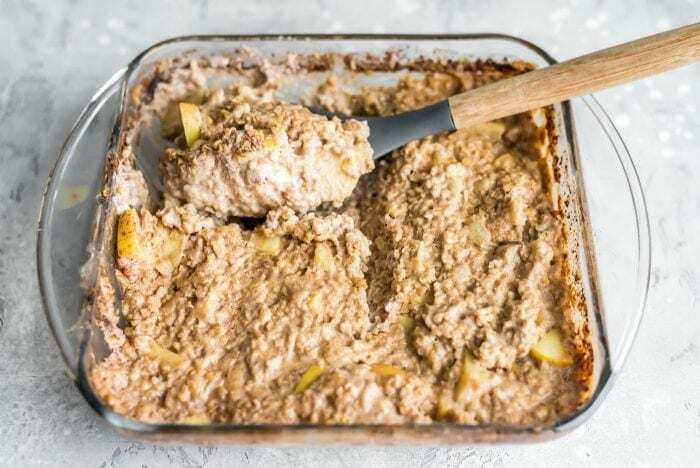 This apple baked steel cut oatmeal is easy to make with just a few ingredients and a few minutes of prep time. It’s ready after an hour of baking in the oven for a warm, filling, nutritious breakfast the whole family will love. This recipe is vegan, gluten-free and has no added sugar. The process for baked still cut oats is as simple as can be. 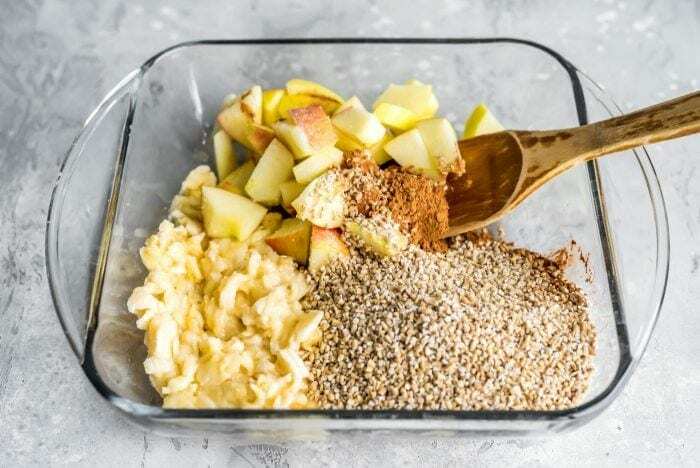 All you need to do is mash the bananas, then mix everything up in a baking dish and bake for an hour. If you have a busy morning, these are great since you only need a couple minutes to prep them then an hour later you’ve got a hearty, warm, filling breakfast ready to go. Follow the pictures below to see how it’s made. Steel cut oats, sometimes called coarse oatmeal or Irish oats, are whole grain groats, the inner portion of the oat kernel which has been cut into pieces. They’re golden in colour and look like chopped nuts and are hard and crunchy. When they’re cooked, they look a bit like cooked brown rice and have a chewy texture and nutty flavour. Steel cut oast are a whole grain and studies have show that eating whole grains tends to extend life expectancy independent of other dietary and lifestyle factors as they reduce the risk of heart disease, type 2 diabetes, obesity and stroke. 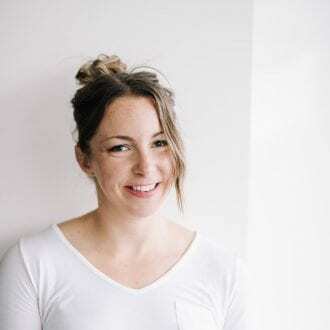 Whole grains have also been shown to reduce inflammation markers in the blood so much that a habitual whole grain intake is linked to a significantly lower risk of dying from inflammatory diseases. 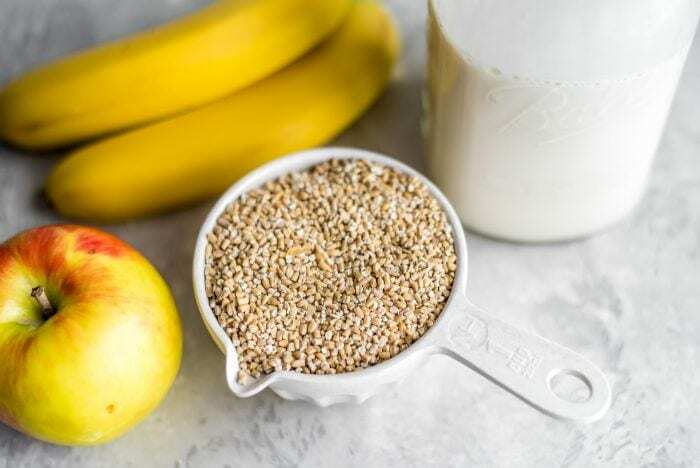 If you’re like to read more about the health benefits of whole grain such as oats, check out my guide to whole grains. 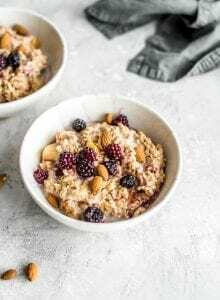 Steel cut oats and rolled oats are very similar in their nutritional profile and how they taste but they differ quite a bit in cooking time and texture. 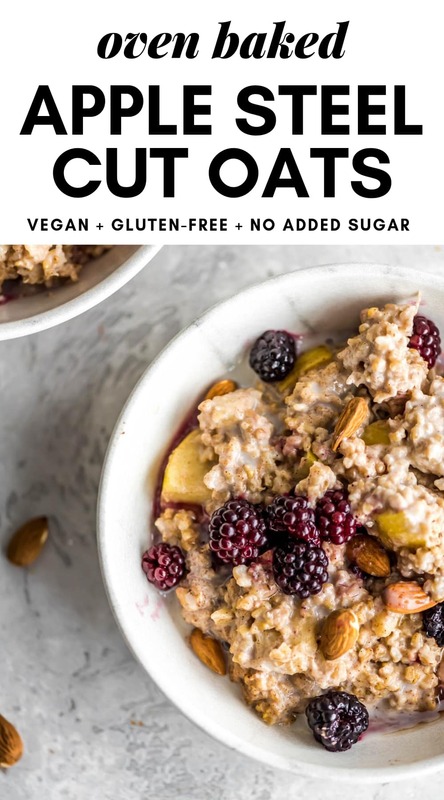 The main difference between them is how they’re manufactured though, steel cut oats being the least processed form of oats. 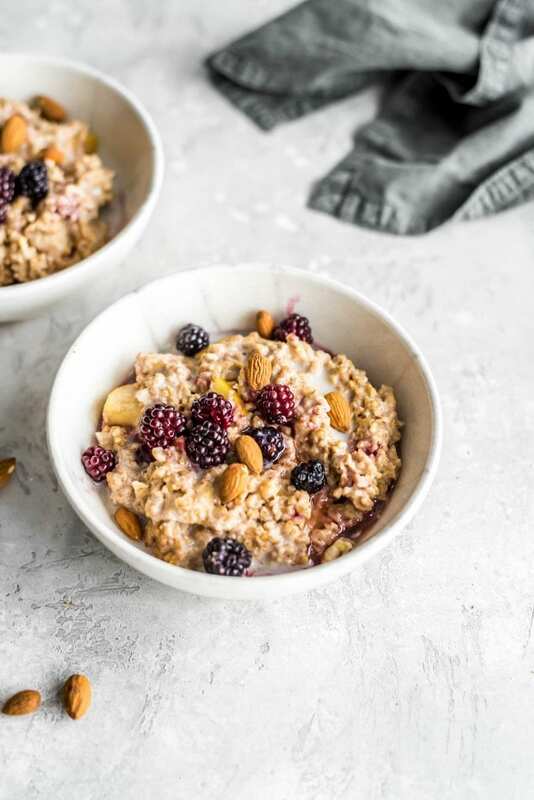 In contrast to steel cut oats, which are simply cut pieces of whole oat groats, rolled oats are flattened which causes the oat to become soft and because of this they’re able to absorb more water and are softer once cooked. How else do they differ? Let’s take a look. Nutrition. Rolled oats and steel cut oats are almost identical in their protein, carbohydrate, fat, vitamin and mineral content. Glycemic index. 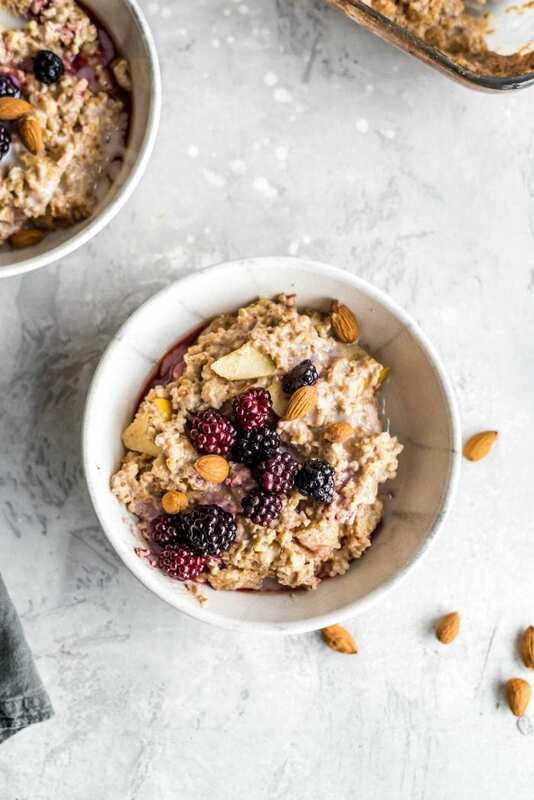 Because steel-cut oats are digested more slowly than rolled oats, they have a lower glycemic index. Low glycemic foods help manage blood sugar, decrease the risk of diabetes and help us stay fuller longer. Texture. Since steel cut oats absorb less liquid than rolled oats, they’re much firmer in texture even when cooked. They don’t get as soft and mushy as rolled oats, regardless of how long you cook them. As for taste, they’re very similar but steel cut oats are just a bit nuttier. Cooking time. Steel cut oats take much longer to cook than rolled oats. Cooked on the stovetop, steel cut oats take about 30 minutes to make but I just love them cooked in the oven for a wonderful, soft but chewy texture. This dish is very easy to make, all you need to do is add all the ingredients to an oven-proof dish, cover and pop it in the oven. An hour later you’ll have a delicious, flavourful and healthy breakfast! I love making this dish as part of my weekly meal prep so I’ve got a healthy breakfast to have before thee gym during the week. You can eat them cold or reheat in the microwave, oven or stovetop with a splash of non-dairy milk. 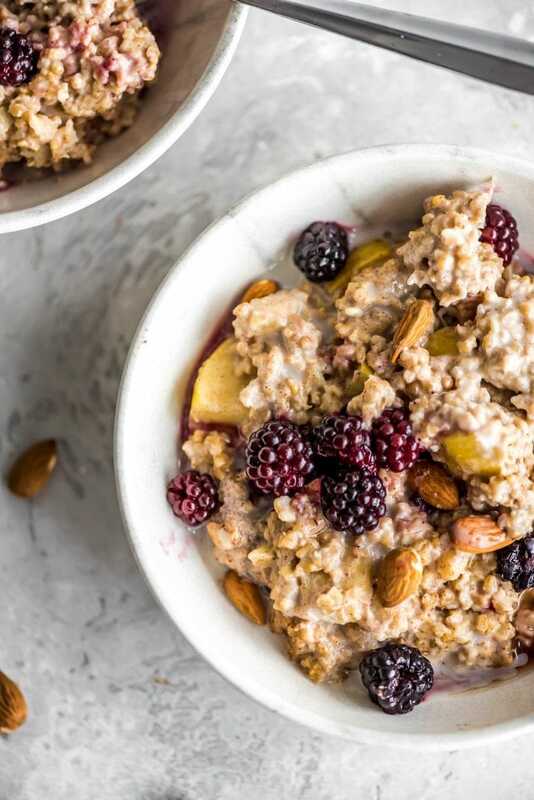 An easy-to-make, delicious and healthy baked oatmeal dish. 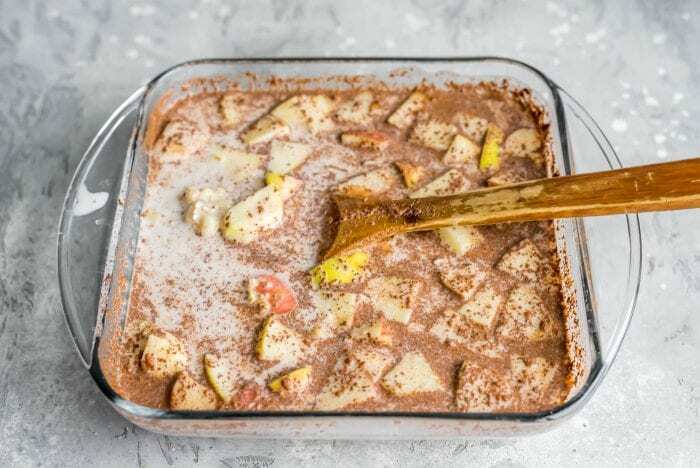 This is the perfect recipe to add to your weekend food prep so you’ve got a quick and hearty breakfast during the week. Try it topped with berries, a drizzle of almond milk and maple syrup and a spoonful of your favorite nut butter. 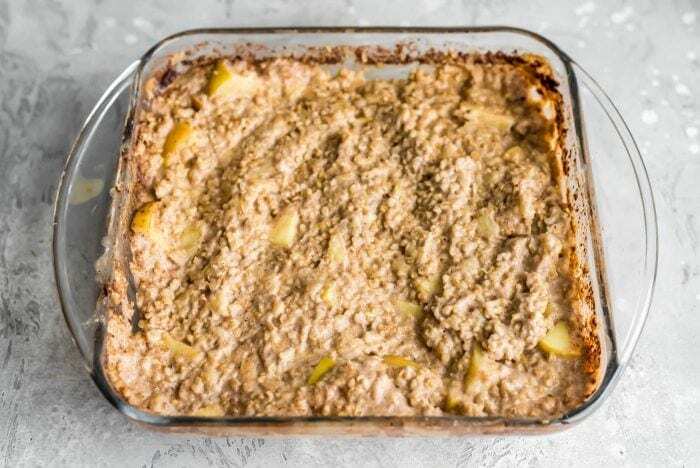 Place the bananas in a glass baking dish (I used an 8×8 square dish) and mash with a fork until they form a paste. Cover and bake for 45 minutes then remove the cover and bake for 15 more minutes. If you don’t have a lid for your baking dish, you can use a baking tray flipped upside down and placed on top of the dish (that’s what I do). Enjoy right away or store in the fridge for up to 5 days, enjoying cold or reheating as needed. These will thicken up as they sit. If reheating later, drizzle with a bit of your favourite non-dairy milk, if you like. Topping ideas: maple syrup, almond milk, berries, banana, peanut or almond butter, nuts, cacao nibs, coconut or tahini. Looks reaaly good 🙂 Will it work with soy or almond milk instead of coconut? Tried this for breakfast this morning – delicious!! Lots of fuel for my morning run and chasing around my 2 year old 😉 Thank you for sharing! I’m so glad you enjoyed it! That’s awesome to hear. This was sooo good!!! Felt like dessert for breakfast! Yep, they would work but you don’t need to bake it as long and you’ll want to reduce the amount of liquid.